A total of 137 snow plows are cleaning and sanding Sofia's streets, the Sofia municipality reported on Sunday. Main streets and boulevards with an area of 11,200 dekares, used by public transportation vehicles, have been thoroughly cleaned, the Municipality says. The exits and entrances to Sofia from the main highways have been cleaned and maintained round the clock. 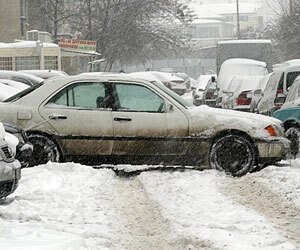 The entrance to Sofia at Vladaya is experiencing the worst snow related problems. "The Vladaya entrance maintenance and cleaning is a responsibility of the State," states the Municipality's press release. Sofia's Mayor Boyko Borisov has had talks with the Municipal Administration and the local Traffic Police in order to secure better traffic organization and eliminate accidents and congestion. Sofia's parks and public transportation stops have also been cleaned by emergency snow crews. All hospitals in the city have been provided with normal access conditions. The municipality had made the commitment to provide by Monday access to all schools and daycare centers. The cleaning of the main neighborhood streets and side streets would begin after the snowfall stops. In the mean time, Doncho Donchev, spokesperson for the National "Road Infrastructure" Agency reported for the Darik radio that over 1,200 snow plows are currently cleaning the country roads. According to Donchev, most sections of the two main Bulgarian highways - "Trakya" and Hemus" are completely clean and without any snow on the road surface. The situation is the most critical in the regions of Kyustendil, Blagoevgrad and Sofia, where the snowfall has been the heaviest, Donchev added. Darik listeners from all over the country have, however, called to report difficult conditions and unsafe roads that have not yet been treated at all. Heavy trucks are currently prohibited from using the "Hemus" highway. Snowfall is registered in almost all mountainous areas in the country and conditions are treacherous, but there have not been any reports of tourists in trouble. All major Bulgarian winter resorts report good skiing conditions - Vitosha, Borovets, Maliovitsa, Bansko and Papmorovo.